The Monterey Bay Aquarium is a wonderful place, but it also has a great opportunity to enhance its stated mission to 'inspire conservation of the oceans' through simple mobile phone technologies. Just before leaving for Oslo, I was able to visit the Monterey Bay Aquarium in California, and I must say that it was a very cool place. The aquariums and habitats were huge and the animals were weird and amazing. 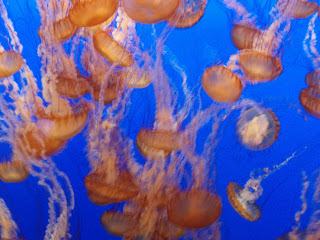 The jellyfish, in particular, stood out, as did my all time favorite, the sea otters. The aquarium, itself, was on the bay - and so was nice to be embedded in this more 'real' environment. In any case, I was visiting the aquarium with this perspective of mobile learning spaces in the back of my mind. As engaging as the place was, I do think that there are opportunities for mobile technologies to enhance the experience. 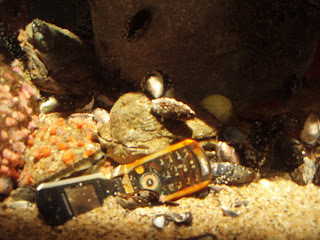 I only noticed one mobile phone of note in the entire aquarium, and it was sitting in the bottom of the tank to the right (see picture). This was a small exhibit on how junk provides hiding places for creatures. A home for a crab? So where was the opportunity for mobile phones? An exhibit called “Vanishing Wildlife” presented fishing industries around the world – and detailed species that are harvested with non-sustainable practices (dolphin safe tuna, being one example). The goal of the exhibit seemed to be behavior change - to get visitors to consume fish that are sustainable, while avoiding those that are collected in a way that harm the environment. So here is a perfect opportunity to utilize kairos in an exhibit design element. Kairos is the principle “of presenting messages at the opportune moment” – (and also the basis for much work at Stanford's Persuasive Technology Lab). Mobile phones are always with you, so they can be useful in identifying and acting at this moment. So more specifically, we have an exhibit with aquariums and fish, as well as signs and interactive displays presenting this “vanishing wildlife.” One can see the fish up close, so the engagement is strong. The information is clear: Pacific Halibut are good, but Atlantic Halibut should be avoided. The problem is, I’m not making any buying or eating decisions right now. I’m in an aquarium, not in a restaurant or grocery store. How can I possibly be expected to remember these distinctions? Through the principle of kairos, perhaps I can be reminded or informed of this information again when I’m able to act on it. The exhibit actually does have pocket-sized cards that list the good to eat and good to avoid species. These are great, and I think an excellent start, but someone going out to a restaurant will almost certainly remember their phone. They would probably be less likely to remember the Seafood Watch pocket guide. You enter the exhibit and see a yellow fin tuna swimming by. You watch the footage of dolphin UNsafe tuna being caught on a fishing boat. You see a few other species and read about why some of the fishing techniques used to catch them are unsustainable. You’re now convinced. You want to make sustainable fish buying decisions. You walk over to the Seafood Watch station. Pocket guides are available, but you can also add a new contact to your cell phone. You type in the phone number, and save it as Fish Guide. Two weeks later, you find yourself at the seafood counter of your grocery store, but you can’t remember which fish are recommended. You send a text message with the word “help” to the Fish Guide number saved in your phone, and seconds later, a list of recommended fish are automatically texted back to you. Based on the recommendation, you buy some pacific halibut. Now you’ve been able to contribute to the sustainability of the fishing industry, and the Aquarium has been able to expand its influence and teaching to outside its own walls. *I must note that the Seafood Watch website does in fact, have a mobile phone guide. This guide, though, is just a website compatible with mobile phone screens. Since most people still don’t use their phones to browse the internet, I think that I text-message system would be simpler and reach a wider audience. Check out this service from Blue Ocean Fishphone. They even give you suggestions on alternative fish options...like tofu! jk, but they do give you more sustainable fish options. Cool, thanks Andrew! So it seems like a texting service does exist - which is great. I wonder if the Monteray Aquarium would be interested in integrating it. My brother works here. I'll have him forward your idea. This post is from a while ago, so I don't know the advances they've made but a better use of technology is something the Exhibits team is definitely exploring.